The 10 Best Mexican Restaurants in Arizona! Looking for great Mexican food? Forget about California and Texas. We all know Arizona has the best Mexican food in the country. Arizona benefits from a shared border and creative restaurant owners that can turn a simple burrito into pure food bliss. Yes, Mexican food is a way of life in Arizona. While the state is home to countless Mexican restaurants, a few stand above the rest. Here are the 10 best Mexican restaurants in Arizona. If you had to sum up Barrio Café in one word it would be authentic. The brainchild of chef Silvana Salcido Esparza, this downtown Phoenix restaurant has inspired dishes that combine classic Mexican ingredients with unique pairings. The result is an iconic menu that attracts customers near and far. You can’t go wrong whether you’re enjoying zesty enchiladas, creamy sopas, or tableside guacamole. The restaurant also has an authentic Mexican vibe. It’s covered in Dia de los Muertos murals and has live music on weekends. 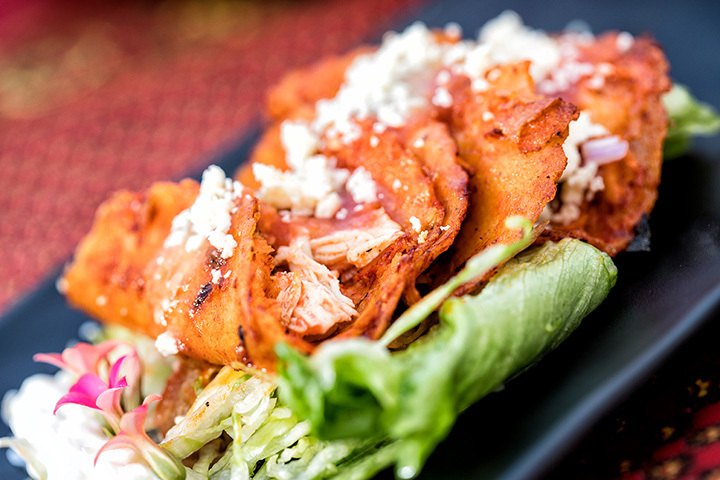 Old Town Scottsdale has fierce competition when it comes to Mexican restaurants. Frank and Lupe’s is so good, however, that it’s really no contest. For over 25 years, Frank and Lupe’s has been delighting hungry patrons with their classic dishes. Their menu includes a mix of appetizers, entrees, and desserts that keep customers coming back for more. Their food is best enjoyed on their spacious patio, where they host happy hour Monday-Friday from 4-6 p.m. For the ultimate taste test, try their combination plate. It includes a tamale, taco, enchilada, two sopapillas, and rice and beans. El Charro Café has been serving their Sonoran style Mexican food to the Tucson community since 1922. Though nearly 100 years-old, El Charro’s handcrafted recipes still feel fresh. Practically every Mexican entrée is available at this historic restaurant. You can enjoy handmade tamales, sizzling fajitas, and egg infused breakfast tacos. Vegetarians will enjoy the g-burro, which is a combination of grilled vegetables, corn tamales, green chile, and avocado. The best menu item, however, is the carne seca platter. It’s a half-pound of shredded marinated beef with green chile, tomato, onions, and guacamole on a flour or corn tortilla. Gadzooks was born out of an appreciation for enchiladas. Founder Aaron Pool created this Phoenix restaurant in order to cater exclusively to the unsung hero of Mexican food dishes. The result is an offering of some of the best Mexican food in the state. Gadzooks is a cafeteria-style restaurant where you can build your own custom enchiladas. You choose between your choice of meat, tortillas, and sauce before topping your enchilada with flavorful toppings. You’ll find tasty extras like goat cheese, fried eggs, jalapeno ranch sauce, and cotija cheese at this Mexican eatery. Chef Daniel Contreras brings his taste of Sonoran Mexico to Tucson. Born in Sonora, Contreras originally opened a hot dog stand before founding El Guero Canelo. This Tucson staple is known for serving authentic tacos, burritos, tortas, and caramelos. In addition, El Guero Canelo was integral in the inception of the Sonoran Dog. This local dish is a bacon wrapped hot dog covered in beans, grilled onions, tomato, mayonnaise, mustard, and jalapeno sauce. Los Reyes de la Torta translates to the king of the torta. That’s a fitting name for this Tempe restaurant. They specialize in creating delicious tortas, which are essentially Mexican sandwiches served on a fresh bun. They also have a variety of tacos, quesadillas, and chilaquiles served with prime meats and salsas. If you’re extra hungry, try the Torta del Rey. It’s a monstrous sandwich with pork, beef, chicken, sausage, and ham with melted cheese and vegetable toppings. Los Dos Molinos has grown from a small restaurant in Springerville, Arizona, into a Mexican food empire. They’ve grown to include five Arizona locations by using a mix of flavors in their menu, most notably New Mexico chilis. Their signature menu item is the adovada ribs, a spicy batch of pork ribs marinated in red chili. You’ll also find classic Mexican favorites like margaritas, tostadas, and sopapillas at this delicious restaurant. Macayos has been an Arizona favorite since 1946. They use farm-grown, local ingredients for dishes on their award-winning menu. Though they now have 13 total locations, Macayos is still a family-owned and operated restaurant. Their menu includes an assortment of burritos, enchiladas, fajitas, and tacos that make locals salivate. Macayo’s also has crispy, meat filled chimichangas and is the self-proclaimed inventor of the deep-fried dish. You can also wash down your food with one of their classic margaritas. Carolina’s Mexican Food is a long-standing part of the Phoenix restaurant scene. This authentic Mexican restaurant has been proudly serving Phoenix since 1968. Their focus on homemade tortillas, burritos, and tamales has led to a long, successful run as one of the Valley’s best restaurants. Their handmade corn and flour tortillas are so delicious they are available for purchase. In addition, Carolina’s is famous for their Machaca burritos. These shredded beef burritos are wrapped in a fresh tortilla, include red or green salsa, and a mound of cheese. It’s love at first bite at Mi Patio Mexican Restaurant. This family-owned and operated restaurant has been dishing up fresh, authentic Mexican food since 1984. You’ll find all the Mexican favorites at this casual, friendly restaurant. They have a wide range of classic menu items including tacos, burritos, tamales, and flautas. You can also enjoy their daily happy hour from 2-6:30 p.m. with specials on everything from margaritas to nachos and mini chimichangas.